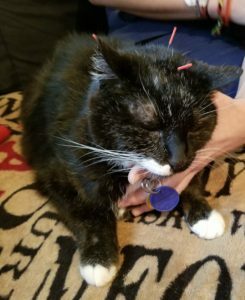 Yes, cats can enjoy acupuncture, too! Many canine and feline patients average getting acupuncture/laser treatments once a week. Severe, acute cases may need 3-4 treatments a week, while others only need treatment every 2-3 weeks, or even monthly! The introductory visit to the clinic is a little more in-depth, since I’ll be getting to know your pet and learning the history. This first visit (initial evaluation, physical exam, and acupuncture) is $82 and lasts 45-60 minutes. If we perform laser treatment, there is an additional $24 fee. Subsequent visits for acupuncture typically last about 25-30 minutes and are $68. If we perform laser therapy, there is an additional $24 fee. We offer package pricing as well. After our initial visit, if your pet responds well, you may elect to purchase a 6-treatment acupuncture package for $395. If we determine your pet would benefit most from a combination of acupuncture and laser treatments, a 6-visit package for both acupuncture and laser costs $525. These packages are good for 365 days, so you may spread treatments out as you need!